The thigh lift is a surgical procedure used to reshape the thighs by the reduction of excess skin and/or fat. During thigh lift surgery the thighs are recontoured to be better proportioned while the remaining skin is smoothed and tightened to improve the appearance of the inner thighs. The thigh lift is a body contouring procedure designed to remove excess skin and smooth, tighten and reshape the thigh. Thigh lifts are not designed for removal of excess fat, this is done by liposuction and Dr. Verma may recommend liposuction as part of your treatment plan to remove excess fat or if your skin has poor elasticity to achieve the best results from your thigh lift. What is thigh lift surgery? Are there different techniques? One method used for an inner thigh lift is to place incisions in the groin which then extend down and wrap around the back of the thigh. Alternatively, excess skin is removed from the groin to the knee by an incision along the inner aspect of the thigh. In some instances, a minimally invasive thigh lift through an incision in the groin area may be suitable. Incisions for an outer thigh lift run from the groin, around the hip and then across the back. Outer thigh lifts have a greater number of incisions. This is dependent upon the extent of your surgery. For a day procedure, your thigh lift surgery will be performed at the brand-new Honeysuckle Day Hospital in Newcastle, a fully licensed and accredited day hospital which specializes in cosmetic surgery. Dr. Verma will discuss this with you at the time of your consultation. The length of the surgery will be dependent upon which area/s are being targeted and whether liposuction is included as part of the procedure. Generally speaking, thigh lift surgery will take between 2- 4 hours of operating time. Type of anaesthesia: General Anaesthesia or in some instances twilight sedation depending upon the type of surgery. Day surgery or inpatient stay? Day Surgery or 2-3 overnight stay. Costs will vary according to the complexity and amount of time required for the surgery. Dr. Verma will discuss this with you at the time of your consultation and his team will provide you with a detailed quote after your visit. If performed for medical reasons, you may be eligible for a Medicare rebate. Do I qualify for thigh lift surgery? Men or women who have hanging skin that does not respond to exercise may benefit from thigh lift surgery, but your individual condition and needs will need to be assessed by Dr. Verma to determine whether thigh lift surgery is the best solution for you. Typically, men or women who have experienced significant weight loss that have hanging skin on the inner or outer thigh and whose weight has been stable for a minimum of three months are good candidates. Thigh lift surgery is not intended for removal of excess fat. If you still have excess fat deposits in your thighs, Dr. Verma will likely recommend you have a combined procedure of liposuction and thigh lift surgery. Dr Verma will take a full medical history and examine your thighs during your consultation. He will discuss your concerns with you and then advise of the best treatment option or series of treatments to achieve results. During your consultation Dr Verma will take photographs to document your appearance pre and post surgery and record the healing process and cosmetic results. Thigh lift surgery results from invisible scars. The location of the scars is dependent upon the type of surgery. Dr. Verma will try to position the scars in the least obvious position. The type of anaesthesia used will be either general anaesthesia or twilight sedation, depending upon the complexity and duration of the surgery. Local anaesthesia may be injected into the site of surgery, giving you better pain relief upon waking. What are the general risks of thigh lift surgery? With any surgical procedure, there are risks involved, however, most problems are easily treated and settle with time. General risks of any surgery include excessive bleeding, reaction to any of the medications (including anaesthesia), infection, poor healing or excessive scarring, blood clots in the veins. What are the specific risks and complications of thigh lift surgery? Unequal tightening of the two thighs. A distortion of the genital contour and appearance. This is a particular risk for women. Formation of a seroma (excess fluid) under the skin around the operating site that may require drainage. You will be provided with detailed instructions by Finesse Cosmetic Surgery with regards to care of your sutures, wounds etc. Following your thigh lift, bandages and dressings will be applied and you will be wrapped in a compression garment. This is to minimize swelling as well as provide support to the operation site during the healing process. You may also need to have excess blood or fluid drained through a small thin tube that is temporarily placed under the skin. Downtime after a thigh lift is dependent upon the extent of the surgery. For inner and medial thigh lifts expect 2-3 weeks downtime, and for larger thigh reductions, expect 4-6 weeks downtime. 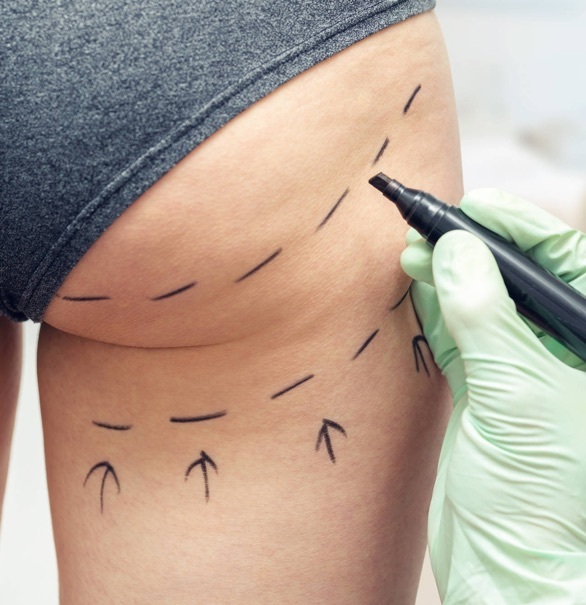 The results from a thigh lift from smoother tight contouring can be seen almost immediately and will then become more apparent after your tissues heal and the swelling and bruising from your operation subside. Full results may take several months to develop. Dr. Verma will see you one week post the operation and then organize subsequent follow-ups according to how you recover. All follow-up visit costs up to three months after the operation are included in the cost of the surgery. Revision surgery for any complications carries extra charges. Similar to your consultation visit (see above), Dr. Verma will be taking photographs of your legs in order to document its healing during follow up visits. How long do the effects of thigh lift surgery last for? Thigh lift surgery is long lasting providing your weight remains stable and you exercise. As we age, our bodies lose firmness, however, most of the initial improvement that you achieved through your thigh lift should remain.